This article is about the earth station. For the TV series, see Pine Gap (TV series). Pine Gap is the commonly used name for a U.S. satellite surveillance base or Australian Earth station approximately 18 kilometres (11 mi) south-west of the town of Alice Springs, Northern Territory in the centre of Australia which is operated by both Australia and the United States. Since 1988, it has been officially called the Joint Defence Facility Pine Gap (JDFPG); previously, it was misleadingly known as Joint Defence Space Research Facility. Partly run by the U.S. Central Intelligence Agency (CIA), U.S. National Security Agency (NSA) and U.S. National Reconnaissance Office (NRO), the station is a key contributor to the NSA's global interception effort, which included the ECHELON program. The classified NRO name of the Pine Gap base is Australian Mission Ground Station (AMGS), while the unclassified cover term for the NSA function of the facility is RAINFALL. The facility has become a key part of the local economy. In late 1966, in the throes of the US/Soviet Cold War, a joint US-Australian treaty called for the creation of a US satellite surveillance base in Australia, to be titled the "Joint Defence Space Research Facility". The purpose of the facility was initially referred to in public as "space research". Operations started in 1970 when about 400 American families moved to Central Australia. Since the demise of the Cold War in 1991 and the rise of the War on Terror in 2001, the base has seen a refocusing away from mere nuclear treaty monitoring and missile launch detection, to become a vital warfighting base for US military forces. In 1999, with the Australian Government refusing to give details to an Australian Senate committee about the relevant treaties, intelligence expert Professor Des Ball from the Australian National University was called to give an outline of Pine Gap. According to Professor Ball, since 9 December 1966 when the Australian and United States governments signed the Pine Gap treaty, Pine Gap had grown from the original two antennas to about 18 in 1999, and 38 by 2017. The number of staff had increased from around 400 in the early 1980s to 600 in the early 1990s and then to 800 in 2017, the biggest expansion since the end of the Cold War. microwave emissions, such as long-distance telephone calls. Ball described the operational area as containing three sections: Satellite Station Keeping Section, Signals Processing Station and the Signals Analysis Section, from which Australians were barred until 1980. Australians are now officially barred only from the National Cryptographic Room (similarly, Americans are barred from the Australian Cryptographic Room). Each morning the Joint Reconnaissance Schedule Committee meets to determine what the satellites will monitor over the next 24 hours. With the closing of the Nurrungar base in 1999, an area in Pine Gap was set aside for the United States Air Force's control station for Defense Support Program satellites that monitor heat emissions from missiles, giving first warning of ballistic missile launches. In 2004, the base began operating a new satellite system known as the Space-Based Infrared System, which is a vital element of US missile defense. Since the end of the Cold War, the station has mainly been employed to intercept and record weapons and communications signals from countries in Asia, such as China and North Korea. The station was active in supporting the wars in Yugoslavia, Afghanistan and Iraq and every US war since the September 11 attacks. The Menwith Hill Station (MHS) in the UK is operated by the NSA and also serves as ground station for these satellite missions. One of the station's primary functions is to locate radio signals in the Eastern Hemisphere, with the collected information fed into the US drone program. This was confirmed by an NSA document from 2013, which says that Pine Gap plays a key role in providing geolocation data for intelligence purposes, as well as for military operations, including air strikes. 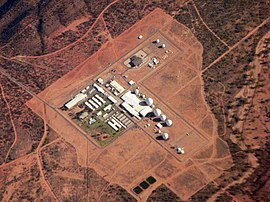 On 11 July 2013, documents revealed through former NSA analyst Edward Snowden showed that Pine Gap, amongst three other locations in Australia and one in New Zealand, contributed to the NSA's global interception and collection of internet and telephone communications, which involves systems like XKEYSCORE. As a US military installation located on foreign soil, Pine Gap has been the site of several community rallies and protests. On 11 November 1983, Aboriginal women led 700 women to the Pine Gap gates where they fell silent for 11 minutes to mark Remembrance Day and the arrival of Pershing II missiles at Greenham Common in Britain. [dubious – discuss] This was the beginning of a two-week, women-only peace camp, organised under the auspices of "Women For Survival". The gathering was non-violent and several women trespassed onto the military base and on one day 111 were arrested and gave their names as Karen Silkwood, an American nuclear worker who was murdered after campaigning for nuclear safety. There were allegations of police brutality and a Human Rights Commission inquiry ensued. In 1986 the base was issued with an eviction notice to be "closed by the people" in a "Close the Gap" campaign, at which women and men in their hundreds gathered from across Australia. In 2002 about 500 people gathered to protest at the gates of Pine Gap, including some politicians[which?]. They were objecting to its use in the then impending Iraq war and missile defence, attracting a massive police presence. ^ Hamlin, Karen (2007). "Pine Gap celebrates 40 years". Defence Magazine. 2007/8 (3): 28–31. ISSN 1446-229X. ^ Dorling, Philip (26 July 2013). "Australian outback station at forefront of US spying arsenal". The Sydney Morning Herald. Retrieved 30 January 2014. ^ Loxley, Adam. The Teleios Ring. Leicester: Matador. p. 296. ISBN 1848769202. ^ Robert Dover; Michael S. Goodman; Claudia Hillebrand, eds. (2013). Routledge Companion to Intelligence Studies. Routledge. p. 164. ISBN 9781134480296. ^ "Mission Ground Station Declassification (NRO)" (PDF). 15 October 2008. National Reconnaissance Office (NRO). Retrieved 28 March 2014. ^ a b c d e Peter Cronau, The Base: Pine Gap's Role in US Warfighting, Background Briefing, ABC Radio National, 20 August, 2017; Ryan Gallagher and Peter Cronau, The U.S. Spy Hub in the Heart of Australia, The Intercept, August 20, 2017. ^ a b c Middleton, Hannah (2009). "The Campaign against US military bases in Australia". In Blanchard, Lynda-ann; Chan, Leah (eds.). Ending War, Building Peace. Sydney University Press. pp. 125–126. ISBN 192089943X. Retrieved 2 November 2012. ^ a b Rosenberg, David (2011). Inside Pine Gap: The Spy who Came in from the Desert. Prahran, Victoria: Hardie Grant Books. ISBN 9781742701738. ^ Harris, Reg Legendary Territorians, Harris Nominees, Alice Springs, 2007, p 93, ISBN 9780646483719. ^ a b Stanton, Jenny (2000). The Australian Geographic Book of the Red Centre. Terrey Hills, New South Wales: Australian Geographic. p. 57. ISBN 1-86276-013-6. ^ "Treaties". www.info.dfat.gov.au. Retrieved 25 November 2017. ^ Dent, Jackie (23 November 2017). "An American Spy Base Hidden in Australia's Outback". Retrieved 25 November 2017 – via www.nytimes.com. ^ Coopes, Amy, Agence France-Presse/Jiji Press, "US eyes Asia from secret Australian base", Yahoo! News, 19 September 2011; Japan Times, 19 September 2011, p. 1. ^ Dorling, Philip (21 July 2013). "Pine Gap drives US drone kills". The Sydney Morning Herald. Retrieved 30 January 2014. ^ Oliver Laughland. "Pine Gap's role in US drone strikes should be investigated – rights groups". The Guardian. Retrieved 21 December 2013. ^ "New Snowden leak: Australia's place in US spying web". rt.com. Retrieved 25 November 2017. ^ "The Anti-Nuclear Campaign". uq.edu.au. Retrieved 25 November 2017. ^ Donna Mulhearn & Jessica Morrison (6 October 2006). "Christian Pacifists Challenge Pine Gap In Court" (Press release). Scoop.co.nz. Retrieved 24 February 2007. ^ "The Queen v Law & Ors  NTCCA 4 (19 March 2008)". www.austlii.edu.au. Retrieved 25 November 2017. ^ Mike Head. "Australian court quashes convictions of protesters for entering US spy base". 1999 Joint Standing Committee on Treaties. An Agreement to extend the period of operation of the Joint Defence Facility at Pine Gap. Report 26. Parliament of the Commonwealth of Australia, October 1999. 2002 Craig Skehan, "Pine Gap gears for war with eye on Iraq". Sydney Morning Herald, 30 September 2002. 2003 Australian Broadcasting Corporation, Pine Gap. Retranscription of program broadcast on 4 August 2003. 2007 "Judge rejects Pine Gap house arrest bid" The Australian, 29 May. 2007 "Aussies eye BMD role" United Press International, 11 Jun. 2007 "Pine Gap protest linked to Iraq war, pacifists tell court" ABC, Australia, 5 Jun. This page was last edited on 25 April 2019, at 04:57 (UTC).